I remember the smoke the most. That pungent smell permeating the camps of tribal people. Everything they touch is infused with the lingering perfume of smoke — their food, shelter, tools, and art. Everything. Even the skin of the youngest tribal child emits smokiness when they pass by. I can hold a memento from my visits decades later and still get a whiff of that primeval scent. Anywhere in the world, no matter the tribe, steady wafts of smoke drift in from the central fire. If things are done properly, the flame never goes out. It smolders to roast bits of meat, and its embers warm bodies at night. The fire’s ever-billowing clouds of smoke dry out sleeping mats overhead, preserve hanging strips of meat, and drive away bugs at night. Fire is a universal tool, good for so many things, and it leaves an indelible mark of smoke on a society with scant other technology. Besides the smoke I remember the immediacy of experience that opens up when the mediation of technology is removed in a rough camp. Living close to the land as hunter-gatherers do, I got colder often, hotter more frequently, soaking wet a lot, bitten by insects faster, more synchronized to rhythm of the day and seasons. Time seemed abundant. I was shocked at how quickly I could dump the cloud of technology in my modern life for a cloud of smoke. But I was only visiting. Living in a world without technology was a refreshing vacation, but the idea of spending my whole life there was, and is, unappealing. Like you, or almost anyone else with a job today, I could sell my car this morning and with the sale proceeds instantly buy a plane ticket to a remote point on earth in the afternoon. A string of very bumpy bus rides from the airport would take me to a drop-off where within a day or two of hiking I could settle in with a technologically simple tribe. I could choose a hundred sanctuaries of hunter-gatherer tribes that still quietly thrive all around the world. At first a visitor would be completely useless, but within three months even a novice could at least pull their own weight and survive. No electricity, no woven clothes, no money, no farm crops, no media of any type — only a handful of hand-made tools. Every adult living on earth today has the resources to relocate to such a world in less than 48 hours. But no one does. The gravity of technology holds us where we are. We accept our attachment. But to really appreciate the effects of technology – both its virtues and costs — we need to examine the world of humans before technology. What were our lives like without inventions? For that we need to peek back into the Paleolithic era when technology was scarce and humans lived primarily surrounded by things they did not make. We can also examine the remaining contemporary hunter-gatherer tribes still living close to nature to measure what, if anything, they gain from the small amount of technology they use. The problem with this line of questioning is that technology predated our humanness. Many other animals used tools millions of years before humans. Chimpanzees made (and of course still make) hunting tools from thin sticks to extract termites from mounds, or slam rocks to break nuts. Even termites themselves construct vast towering shells of mud for their homes. Ants herd aphids and farm fungi in gardens. Birds weave elaborate twiggy fabrics for their nests. The strategy of bending the environment to use as if it were part of your body is a billion year old trick at least. Our humanoid ancestors first chipped stone scrapers 2.5 million years ago to give themselves claws. By about 250,000 years ago they devised crude techniques for cooking, or pre-digesting, with fire. Technology-assisted hunting, versus tool-free scavenging, is equally old. Archeologists found a stone point jammed into the vertebra of a horse and a wooden spear embedded in a 100,000 year old red deer skeleton. This pattern of tool use has only accelerated in the years since. To put it another way, no human tribe has been without at least a few knives of bone, sharpened sticks, or a stone hammer. There is no such thing as a total tool-free humanity. Long before we became the conscious beings we are now we were people of the tool. Hunters increased the power of a spear by launching it from a long swinging stick (the atlatl) which literally extended their arm. In fact all tools are extensions of our biological body, just as the artifact of a beehive is an extension of a bee. Neither honeycomb nor queen bee can exist alone. Same for us. Evolutionarily we’ve survived as a species because we’ve made tools, and we’d perish as a species without at least some of our inventions. Although strictly speaking simple tools are a type of technology made by one person, we tend to think of technology as something much more complicated. But in fact technology is anything designed by a mind. Technology includes not only nuclear reactors and genetically modified crops, but also bows and arrows, hide tanning techniques, fire starters, and domesticated crops. Technology also includes intangible inventions such as calendars, mathematics, software, law, and writing, as these too derive from our heads. But technology also must include birds’ nests and beaver dams since these too are the work of brains. All technology, both the chimp’s termite fishing spear and the human’s fishing spear, the beaver’s dam and the human’s dam, the warbler’s hanging basket and the human’s hanging basket, the leafcutter ant’s garden and the human’s garden, are all fundamentally natural. We tend to isolate human-made technology from nature, even to the point of thinking of it as anti-nature, only because it has grown to rival the impact and power of its home. But in its origins and fundamentals a tool is as natural as our life. Tools and bigger brains mark the beginning of a distinctly human line in evolution 2.5 million years ago. The first simple stone tools appeared in the same archeological moment that brains of the hominins who made them began to enlarge toward their current size. Thus hominins arrived on earth with rough chipped stone scrapers and cutters in hand. About a million years ago these large-brain, tool-wielding hominins drifted out of Africa and settle into southern Europe, where they evolved into the Neanderthal (with even bigger brains), and further into east Asia, where they evolved into Homo erectus (also bigger brained). Over the next several millions of years, all three hominin lines evolved, but the ones who remained in Africa evolved into the human form we see in ourselves. The exact time these proto-humans became fully modern humans is of course debated. Some say 200,000 years ago but the undisputed latest date is 100,000 years ago. By 100,000 years ago humans crossed the threshold where they are indistinguishable from us outwardly. We would not notice anything amiss if one of them were to stroll alongside of us on the beach. However, their tools and most of their behavior were indistinguishable from their relatives the Neanderthals in Europe and Erectus in Asia. Then about 50,000 years ago something amazing happened. While the bodies of early humans in Africa remained unchanged, their genes and minds shifted noticeably. For the first time hominins were full of ideas and innovation. These newly vitalized modern humans, which we now call Sapiens, charged into new regions beyond their ancestral homes in eastern Africa. They fanned out from the grasslands and in a relatively brief burst exploded from a few tens of thousands in Africa to an estimated 8 million worldwide just before the dawn of agriculture 10,000 years ago. 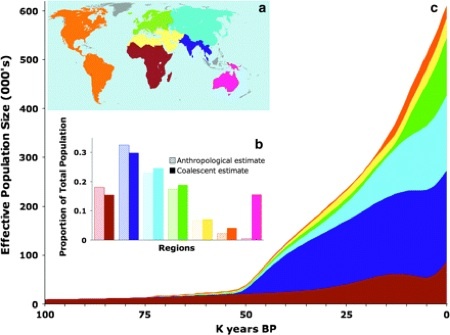 A simulation of the 50,000 year BP population explosion in prehistory. From Atkinson. The speed at which Sapiens marched across the planet and settled every continent (except Antarctica) is astounding. In 5,000 years they overtook Europe. In another 15,000 they reached edges of Asia. Once tribes of Sapiens crossed the land bridge from Eurasia into what is now Alaska, it took them only a few thousand years to fill the whole of the New World. Sapiens increased so relentlessly that for the next 38,000 years they expanded their occupation at the average rate of one mile per year. Sapiens kept pushing until they reached the furthest they could go: land’s end at the tip of South America. Less than 1,500 generations after their “great leap forward” in Africa, Homo sapiens had become the most widely distributed species in Earth’s history, inhabiting every type of biome and every watershed on the planet. Sapiens were the most invasive alien species ever. Today the breadth of Sapien occupation exceeds that of any other macro-species we know of; no other visible species occupies more niches, geographically and biological, than Homo sapiens. Sapien’s overtake was always rapid. Jared Diamond notes that “after the ancestors of the Maori reached New Zealand” carrying only a few tools, “it apparently took them barely a century to discover all worthwhile stone sources; only a few more centuries to kill every last moa in some of the world’s most rugged terrain.” This sudden global expansion following millennia of steady sustainability is due to only one thing: technology and innovation. As Sapiens expanded in range they remade animal horns and tusks into thrusters and knives, cleverly turning the animals’ own weapons against them. They sculpted figurines, the first art, and the first jewelry, beads cut from shells, at this threshold 50,000 years ago. While humans had long used fire, the first hearths and shelter structures were invented about this time. Trade of scarce shells, chert and flint rock began. At approximately the same time Sapiens invented fishing hooks and nets, and needles for sewing hides into clothes. They left behind the remains of tailored hides in graves. In fact, graves with deliberately interred burial goods were invented at this time. Sometimes recovered beads and ornaments in the burial site would trace the borders of the long-gone garments. A few bits of pottery from that time have the imprint of woven net and loose fabrics on them. In the same period Sapiens also invented animal traps. Their garbage reveals heaps of skeletons of small furred animals without their feet; Trappers today still skin small animals the same way by keeping the feet with the skin. On walls artists painted humans wearing parkas shooting animals with arrows or spears. Significantly, unlike Neanderthal and Erectus’s crude creations, these tools varied in small stylistic and technological ways place by place. Sapiens had begun innovating. The Sapien mind’s ability to make warm clothes opened up the artic regions, and the invention of fishing gear opened up the coasts and rivers of the world, particularly in the tropics, where large game was scarce. While Sapien’s innovation allowed them to prosper in new climates, the cold and its unique ecology especially drove innovation. More complex “technological units” are needed (or have been invented) by historical hunter-gatherer tribes the higher the latitude of their homes. Hunting oceanic sea mammals in artic climes took significantly more sophisticated gear that fishing salmon in a river. The ability of Sapiens to rapidly adapt tools allowed them to rapidly adapt to new ecological niches, at a much faster rate than genetic evolution could ever allow. During their quick global takeover, Sapiens displaced (with or without interbreeding) the several other co-inhabiting hominin species on earth, including their cousins the Neanderthal. The Neanderthals were never abundant and may have only numbered 18,000 individuals at once. After dominating Europe for hundreds of thousands of years as the sole humanoid, the Neanderthals vanished in less than 100 generations after the tool-carrying Sapiens arrived. That is a blink in history. As anthropologist Richard Klein says, “this displacement occurred almost instantaneously from a geologic perspective. There were no intermediates in the archeological record. The Neanderthals were there one day, and the Cro-Magnons [Sapiens] were there the next.” The Sapien layer was always on top, and never the reverse. It was not even necessary that the Sapiens slaughter the Neanderthals. Demographers have calculated that as little as a 4 percent difference in reproductive effectiveness (a reasonable expectation given Sapien’s ability to bring home more kinds of meat), could eclipse the lesser breeding species in a few thousands years. The speed of this several thousand-year extinction was without precedent in natural evolution. Sadly it was only the first rapid species extinction to be caused by humans. It should have been clear to Neanderthal, as it is now clear to us in the 21st century, that something new and big had appeared — a new biological and geological force. A number of scientists (Richard Klein, Ian Tattersall, William Calvin, among many others) think that the “something” that happened 50,000 years ago was the invention of language. Up until this point, humanoids were smart. They could make crude tools in a hit or miss way and handle fire – perhaps like an exceedingly smart chimp. The African hominin’s growing brain size and physical stature had leveled off its increase, but evolution continued inside the brain. “What happened 50,000 years ago,” says Klein, “was a change in the operating system of humans. Perhaps a point mutation effected the way the brain is wired that allowed languages, as we understand language today: rapidly produced, articulate speech.” Instead of acquiring a larger brain, as the Neanderthal and Erectus did, Sapien gained a rewired brain. Language altered the Neanderthal-type mind, and allowed Sapien minds for the first time to invent with purpose and deliberation. Philosopher Daniel Dennet crows in elegant language: “There is no step more uplifting, more momentous in the history of mind design, than the invention of language. When Homo sapiens became the beneficiary of this invention, the species stepped into a slingshot that has launched it far beyond all other earthly species.” The creation of language was the first singularity for humans. It changed everything. Life after language was unimaginable to those on the far side before it. Language accelerates learning and creation by permitting communication and coordination. A new idea can be spread quickly by having someone explain it and communicate it to others before they have to discover it themselves. But the chief advantage of language is not communication, but auto-generation. Language is a trick which allows the mind to question itself. It is a magic mirror which reveals to the mind what the mind thinks. Language is a handle which turns a mind into a tool. With a grip on the slippery aimless activity of self-reference, self-awareness, language can harness a mind into a fountain of new ideas. Without the cerebral structure of language, we can’t access our own mental activity. We certainly can’t think the way we do. Try it yourself. If our minds can’t tell stories, we can’t consciously create; we can only create by accident. Until we tame the mind with an organization tool capable of communicating to itself, we have stray thoughts without a narrative. We have a feral mind. We have smartness without a tool. A few scientists believe that, in fact, it was technology that sparked language. To throw a tool – a rock or stick – at an animal and hit it with sufficient force to kill it requires a serious computation in the hominin brain. Each throw requires a long succession of precise neural instructions executed in a split second. But unlike calculating how to grasp a branch in mid-air, the brain must calculate several alternative options for a throw at the same time: the animal speeds up, or it slows down; aim high, aim low. The mind must then spin out the results to gauge the best possible throw before the actual throw – all in a few milli-seconds. Scientists like neurobiologist William Calvin believe that once a brain evolved the power to run multiple rapid throw scenarios, it hijacked this throw procedure to run multiple rapid sequences of notions. The brain would throw words instead of sticks. This reuse or repurposing of technology then became a primitive but advantageous language. The slippery genius of language opened up many new niches for spreading tribes of Sapiens. They could quickly adapt their tools to hunt or trap an increasing diversity of game, and to gather and process an increasing diversity of plants. There is some evidence that Neanderthals were stuck on a few sources of food. Examination of Neanderthal bones show they lacked the fatty acids found in fish and the Neanderthal diet was mostly meat. But not just any meat. Over half of their diet was woolly mammoth and reindeer. The demise of the Neanderthal may be correlated with the demise of great herds of these megafuana. Sapiens thrived as broadly omnivorous hunter-gatherers. The unbroken line of human offspring for hundreds of thousands of years proves that a few tools will capture enough nutrition to create the next generation. We are here now because hunting-gathering in the past worked. Several analysis of historical hunter-gather diets show that they were able to secure enough calories to meet the US FDA requirements for folks their size. For example, the Dobe gathered on average 2,140 calories. Fish Creek tribe, 2,130. Hemple Bay tribe, 2,160. They had a varied diet of tubers, vegetables, fruit and meat. Based on studies of bones and pollen in their trash, so did the early Sapiens. Thomas Hobbe claimed the life of the savage – and by this he meant hunter-gatherers — was “nasty, short and brutish.” But while the life of an early hunter-gatherer was short, and interrupted by nasty warfare, it was not brutish. 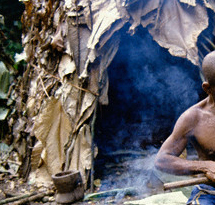 With only a slim set of a dozen primitive tools humans not only secured enough to survive in all kinds of environments, but these tools and techniques will also afford them some leisure doing so. Anthropological studies confirm that hunter-gathers do not spend all day hunting and gathering. One researcher, Marshall Sahlins, concluded that hunter-gatherers worked only 3-4 hours a day on necessary food chores, putting in what he called “banker hours.” The evidence for his surprising results are controversial: much of the research (by others) was based on time studies of groups who were previously hunting and gathering and returned to this mode only for a few weeks to demonstrate their efficiency. And the measurements lasted only a few weeks. Surveys of other tribes’ yields gave daily calorie intakes of only 1,500 or 1,800 per day for their few hours of work. Furthermore the definition of what activities should be included as the work of food getting is not clear. For instance if a modern human goes shopping at a supermarket — to get food of course — is that classified as “work” time? Why not? Do the elaborate preparations for a community feast where food is exchanged, common to most forager tribes, count as food getting? All these variables shift the measure of how much work it takes to live as a hunter-gatherer with a low dose of technology. A more realistic and less contentious average for food gathering time among contemporary hunter-gatherer tribes based on a wider range of data is about 6 hours per day. That 6 hour/day average belies a great variation in day to day routine. One to two hour naps or whole days spent sleeping were not uncommon. As one anthropologist noted, when foragers set out to work, “they certainly did not approach it as an unpleasant job to be got over as soon as possible, nor as necessary evil to be postponed as long as possible.” Outside observers almost universally noted the punctuated aspect of work among foragers. Gatherers may work very hard for several days in a row and then do nothing in terms of food getting for the rest of the week. This cycle is known among anthologists as the “paleolithic rhythm” — a day or two on, day or two off. An observer familiar with the Yamana tribe – but it could be almost any hunter tribe — wrote: “Their work is a more a matter of fits and starts, and in these occasional efforts they can develop considerable energy for a certain time. After that, however they show a desire for an incalculably long rest period during which they lie about doing nothing, without showing great fatigue.” The paleolithic rhythm actually reflects the “predator rhythm” since great hunters of the animal world, the lion and other large cats, exhibit the same style: hunting to exhaustion in a short burst and then lounging around days afterward. Hunters, almost by definition, seldom go out hunting, and they succeed in getting a meal even less often. The efficiency of primitive tribal hunting, measured in the yield of calories/hour invested, was only half that of gathering. Meat is thus a treat in almost every foraging culture. Then there are seasonal variations. Every ecosystem produces a “hungry season” for foragers. In higher cooler latitudes, this late-winter/early spring hungry season is more severe, but even in tropical latitudes, there are seasonal oscillations in the availability of favorite foods, supplemental fruits, or essential wild game. In addition, there are climatic variations: extended periods of droughts, floods, storms that can disrupt yearly patterns. This great punctuations over days, season, and years mean that while there are many times when hunter-gatherers are well-fed, they also can – and do – expect many periods when they are hungry, famished and undernourished. Time spent in this state along the edge of malnutrition is mortal for young children and dire for adults. The result of all this variation in calories is the paleolithic rhythm at all scales of time. Importantly, this burstiness in “work” is not by choice. When you are primarily dependent of natural systems to provide you foodstuffs, working more does not tend to produce more. You can’t get twice as much food by working twice as hard. The hour which the figs ripen can neither be hurried, nor predicted exactly. Nor can the arrival of game herds. If you do not store surplus, nor cultivate in place, then motion must produce your food. Hunter-gatherers must be in ceaseless movement away from depleted sources in order to maintain production. But once you are committed to perpetual movement, surplus and its tools slow you down. In many contemporary hunter-gatherer tribes, being unencumbered with things is considered a virtue, even a virtue of character. You carry nothing, but cleverly make or procure whatever you need when you need it. “The efficient hunter who would accumulate supplies succeeds at the cost of his own esteem”, says Robert Kelley. Additionally the surplus producer must share the extra food or goods with everyone, which reduces incentive to produce extra. For foragers food storage is therefore socially self-defeating. Instead your hunger must adapt to the movements of the wild. If a dry spell diminishes the yield of the sago, no amount of extra work time will advance the delivery of food. Therefore, foragers take a very accepting pace to eating. When food is there, all work very hard. When it is not, no problem; they will sit around and talk while they are hungry. This very reasonable approach is often misread as tribal laziness, but it is in fact a logical strategy if you rely on the environment to store your food. We civilized modern workers can look at this leisurely approach to work and feel jealous. Three to six hours a day is a lot less then most adults any developed country put in to their labors. Furthermore, when asked, most acculturated hunter-gatherers don’t want any more than they have. A tribe will rarely have more than one artifact, such as an ax, because why do you need more than one? Either you use the object when you need to, or more likely, you make one when you need one. Once used, artifacts are often discarded rather than saved. That way nothing extra needs to be carried, or cared for. Westerns giving gifts to foragers such as a blanket or knife were often mortified to see them trashed after a day. In a very curious way, foragers lived in the ultimate disposable culture. The best tools, artifacts, technology were all disposable. Elaborate hand-crafted shelters were considered disposable. When a clan or family travel they might erect a home for only a night (a bamboo hut or snow igloo) and then abandoned it the next morning. Larger multi-family lodges might be abandoned after a few years rather than maintained. Same for food patches, which are abandoned after harvesting. This easy just-in-time self-sufficiency and contentment led Marshall Sahlins to declare hunter-gatherers as “the original affluent society.” But while foragers had sufficient calories most days, and did not create a culture that continually craved more, a better summary might be that hunter-gatherers had “affluence without abundance.” Based on numerous historical encounters with aboriginal tribes, they often, if not regularly, complained about being hungry. Famed anthropologist Collin Turnball noted “The Mbuti complain of food shortage, although they frequently sing to the goodness of the forest.” Often the complaints of hunter-gathers were about the monotony of a carbohydrate stable, like mongongo nuts for every meal; what they meant about shortages, or even hunger, was a shortage of meat, and a hunger for fat, and a distaste for periods of hunger. Their small amounts of technology gave them sufficiency for most of the time, but not abundance. The fine line between average sufficiency and abundance matters in terms of health. When anthropologists measure the total fertility rate (the mean number of live births over the reproductive years) of women in modern hunter-gather tribes they find it relatively low – about 5 to 6 children in total — compared to the 6-8 of agricultural communities. There are several factors behind this depressed fertility. Perhaps because of uneven nutrition, puberty comes late to forager girls at 16 or 17 years old. (Modern females start at 13) This late menarche for women, combined with a shorter lifespan, delays and thus abbreviates the childbearing window. Breastfeeding usually lasts longer in foragers, which extends the interval between births. Most tribes nurse till children are 2 to 3 years old, while a few tribes keep suckling for as long as 6 years. Also, many women are extremely lean and active, and like lean active women athletes in the west, often have irregular or no menstruations. One theory suggests women need a “critical fatness” to produce fertile eggs, a fatness many forager women lack – at least part of the year — because of a fluctuating diet. And of course, people anywhere can practice deliberate abstinence to space children, and foragers have reasons to do so. Infanticide also contributed to small families. 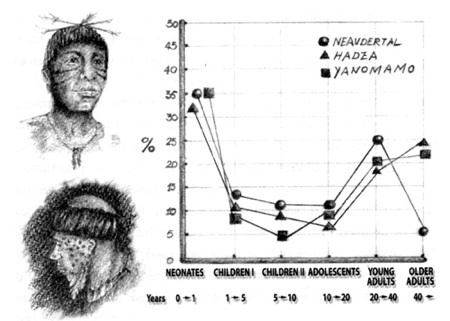 The prevalence of infanticide varied significantly among foraging tribes. It was as high as 30% of children in traditional artic tribes (in the early 1900s), and zero in others, with an average infanticide rate of 21% among the cross-culture sample of tribes anthropologists measured. In some cultures infanticide was biased towards females, perhaps to balance gender ratios, particularly in tribes where men contributed more food to the family than women (which was not the norm). In other tribes infanticide was practiced to space births, as Robert Kelley says, “in order to maximize reproductive success, rather than population control.” In nomadic cultures mothers needed to carry not only their tools and household items, but also their small children. On frequent long migrations to find food a family had to carry all their possessions. For a pregnant woman to carry more than one small child would endangered the older sibling. Better for all to have children spaced apart. Child mortality in foraging tribes was severe. A survey of 25 hunter-gatherer tribes in historical times from various continents revealed that on average 25% of children died before they were one, and 37% died before they were 15. In one traditional hunter-gather tribe child mortality was found to be 60%. Most historical tribes have a population growth rate of approximately zero. This depression is made evident, says Robert Kelley in his survey of hunter-gathering peoples, because “when formerly mobile people become sedentary, the rate of population growth increases.” All things equal, the constancy of farmed food breeds more people. While many children died young, hunting-gather elders did not have it much better. There are no known remains of a Neanderthal who lived to be older than 40. Because extremely high child mortality rates depress average life expectancy, if the outlier oldest is only 40, the median age of a Neanderthal was less than 20. It was a tough life. Based on an analysis of bone stress and cuts, one archeologist said the distribution of injuries on the bodies of Neanderthal were similar to those found on rodeo professionals -– lots of head, trunk and arm injuries like the ones you might get from close encounters with large angry animals. Erik Trinkaus discovered that the pattern of age-related mortality for hunter-gatherers and Neanderthal were nearly parallel, except historical foragers lived a little longer. A typical tribe of hunters-gatherers had few very young children and no old people. This demographic may explain a common impression visitors had upon meeting intact historical hunter-gatherer tribes. They would remark that “everyone looked extremely healthy and robust.” That’s in part because most everyone was in the prime of life between 15 and 35. We might have the same reaction visiting a city or trendy neighborhood with the same youthful demographic. We’d call them young adults. Tribal life was a lifestyle for and of young adults. A major effect of this short forager lifespan was the crippling absence of grandparents. Given that women would only start bearing by 17 or so, and die by their thirties, it would be common for parents leave their children in their tweens. We tend to think that a shorter lifespan is rotten -– for the individual -– and no doubt it is. But a short lifespan is extremely detrimental for a society as well. Because without grandparents, it becomes exceedingly difficult to transmit knowledge over time. Grandparents are the conduit of culture, and without them, culture stagnates. Imagine a society that not only lacked grandparents but also lacked language –- as the pre-Sapiens did. How would learning be transmitted over generations? Your own parents would die before you were an adult and in any case, they could not communicate to you anything beyond what they could show you while you were immature. You would certainly not learn anything from anyone outside your immediate circle of peers. Innovation and cultural learning cease to flow. Language upended this tight constriction by enabling both an idea to form, and then to be communicated. An innovation could be hatched and then spread across generations via children. Sapiens gained better hunting tools (like thrown spears which permitted a lightweight human to kill a huge dangerous animal from a safe distance), better fishing tools (barbed hooks and traps), and using hot stones to cook not just meat but to extract more calories from wild plants. And they gained all these within only 100 generations of using language. Better tools meant better nutrition. The primary long-term consequence of this slightly better nutrition was a steady increase in longevity. Anthropologist Rachel Caspari studied the dental fossils of 768 hominin individuals from 5 million years ago, till the great leap, in Europe, Asia and Africa. She determined that there was a “dramatic increase in longevity in the modern humans” about 50,000 years ago. Increasing longevity allowed grand parenting, or what is called the “grandmother effect”: In a virtuous circle, via the communication of grandparents and culture, ever more powerful innovations were able to lengthened life spans further, which gave more time to invent new tools, which increased population. Not only that, increased longevity, “provides a selective advantage promoting further population increase,” because a higher density of humans increased the rate and influence of innovations, which contributed to increased populations. Caspari states that the most “fundamental biological factor that underlies the behavioral innovations of modernity is the increase in adult survivorship.” Increased longevity is probably the most measurable consequence of the acquisition of technology, and it is also the most consequential. By 20,000 years ago, as the world was warming up and its global ice caps retreating, Sapien’s population and tool kit expanded hand-in-hand. Sapiens used 40 kinds of tools, including anvils, pottery, and composites – complicated spears or cutters made from multiple pieces, such as many tiny flint shards and a handle. While still primarily a hunter-gatherer Sapiens also dappled in sedentism, returning to care for favorite food areas, and developed specialized tools for different types of ecosystems. We know from burial sites in the northern latitudes at this same time, that clothing also evolved from the general (a rough tunic) to specialized items such as a cap, a shirt, a jacket, trousers and moccasins. Henceforth the variety of human tools would become ever more specialized. The variety of Sapiens tribes exploded as they adapted into diverse watersheds and biomes. Their new tools reflected the specifics of their homes; river inhabitants had many nets; steppe hunters many kinds of points; forest dwellers many types of traps. Their language and looks were diverging. Yet they shared many qualities. Most hunter-gatherers clustered into family clans that averaged about 25 related people. Clans would gather in larger tribes of several hundred at seasonal feasts or camping grounds. One function of the tribes was to keep genes moving through intermarriage. Population was spread thinly. The average density of a tribe was less than .01 person per square kilometer in cooler climes. The 200-300 folk in your greater tribe would be the total number of people you’d meet in your lifetime. You might be aware of others outside of them because items for trade or barter could travel 300 kilometers. Some of the traded items would be body ornaments and beads, such as ocean shells for inlanders, forest feathers for the coast dwellers. Occasionally pigments were swapped for face painting, but these could also be applied on walls, or applied to carved wood figurines. The dozen tools you carried would have been bone drills, awls, needles, bone knives, a bone hook for fish on a spear, some stone scrapers, maybe some stone sharpies. A number of your blades would be held by bone or wood handles, hafted with cane or hide cord. When you crouched around the fire, someone might play a drum or bone flute. The handful of your possessions might be buried with you when you die. But don’t take this for harmony. Within 20,000 years of the great march out of Africa, Sapiens helped exterminate 270 out of the 279 then existing species of megafuana. Sapiens used new innovations such as the bow and arrow, spear, and cliff-stampedes to kill off the last of the mastodons, mammoths, moas, woolly rhinos, giant camels — basically every large package of protein that walked on four legs. More than 80% of all large mammal genera on the planet were completely extinct by 10,000 years ago. Somehow four species escaped this fate in North America: the bison, moose, elk and red deer. Before the singularity of language 50,000 years ago, the world lacked significant technology. For the next 40,000 years (four times as long as civilization has been around) every human who lived was a hunter-gatherer. During this time an estimated 1 billion people explored how far you could go with a handful of tools. This world without much technology provided “enough.” There was leisure and satisfying work for humans. Happiness, too. Without technology, the rhythms and patterns of nature were immediate. Nature ruled your hunger and set your course. Nature was so vast, so bountiful and so close, few humans could separate from it. The attunement with the natural world felt divine. Yet, without technology, the recurring tragedy of child death was ever present. Accidents, warfare and disease meant your life, on average, was far less than half what it could have been. Maybe only a quarter of the natural lifespan you genes afforded. Hunger was always near. But most noticeably, without technology, your leisure was wasted. You had much time for repetitions, but none for anything new. Within narrow limits you had no bosses. But the direction and interests of your life were laid out in well-worn paths. The cycles of your environment determined your life. Turns out, the bounty of nature, though vast, does not hold all possibilities. The mind does, but it had not been fully unleashed yet. A world without technology had enough to continue life but not enough to transcend it. The mind, liberated by language, and enabled by the technium, transcended the constraints of nature, and opened up greater realms of possibility. There was a price to pay for this transcendence, but what we gained was civilization and progress. Those would disappear instantly if technology were to disappear. If a Technology Removal Beam swept across the earth and eliminated every scrap of invention from the world, and sent us into a world without technology – the bus ride no one wants to take – it would shake our foundations. Once the Beam pulverized all hunks of metal, metallic pieces, and slivers of iron and steel into rock dust, and vaporized all plastic, and of course zapped all electronics and modern medicines, and eroded highways and bridges till they disappeared into the landscape without a trace, then the first thing we’d want to do is re-manufacture some hand tools. But if the Technology Removal Beam prevented any constructed tools at all, humans, and humanity, would rapidly be endangered. After the vast asphalt parking lots of suburban malls melted away, and the greasy blocks of industrial factories subsided beneath the dirt, and the endless sprawl containing hundreds of millions of homes vanished in dust, there would still not be enough bounty in the regrown wilds to sustain 6 billion foragers. For one, the hugely productive herds of megafuana that supported millions of earlier hunters are gone for good. We devoured their easy pickings 20 millennia ago, and removing technology won’t return them. For another the current global population of humans spread equally across all land mass on the planet, including the least hospitable areas of icy mountains and empty desert, would be 10 persons per square kilometer, which is several times more than the average density of sustainable foraging. Thus even a pristine environment could not support 6 billion Sapiens at the meager level of a hunter-gather. Not that we’d last long anyway. Deprived of gun, spear, and knife, humans would no longer be the key predator. We in fact become prey. Any human lucky enough to eat well would become a desirable meal for newly revived packs of wolves and other alpha predators. The stress and inadequate nutrition of subsistence foraging would revert women’s fertility to its earlier low rate. The growth rate of Homo sapiens would head quickly towards zero. The entirety of the species would retreat to a few remote havens, much as gorillas and chimpanzees have done. We are not the same folks who marched out of Africa. Our genes have co-evolved with our inventions. In the past 10,000 years alone, in fact, our genes have evolved 100 times faster than the average rate for the previous 6 million years. This should not be a surprise. In the same period we domesticated the dog (all those breeds) from wolves, and cows and corn and more from their unrecognizable ancestors. We, too, have been domesticated. We have domesticated ourselves. Our teeth continue to shrink, our muscles thin out, our hair disappear, our molecular digestion adjust to new foods. Technology has domesticated us. As fast as we remake our tools, we remake ourselves. We are co-evolving with our technology, so that we have become deeply co-dependent on it. Sapiens can no longer survive biologically without some kind of tools. Nor can our humanity continue without the technium. In a world without technology, we would not be living, and we would not be human. It’s amazing and somehow scary how we’ve been modelling ourselves even in the most intimate physiological level since the very beginning. This makes you think that genetic tweaking and other controversial technological subjects aren’t as alien to us as we could think. They’re just another step into a direction we simply can’t avoid and actually need to survive. I hope itâ€™s the opening passage of your book. I loved this post. It seems that many modern humans are oblivious to the fact that their way of life is made possible by technology. As you point out, even the successful hunter gatherer’s soon developed technology and depended on it for survival. Visits to low tech cultures are indeed very interesting, but as you say, it is a very rare person who decides to chuck all they have and live low tech permanently. Technology is so pervasive that we never have the experience of “missing the water when the well runs dry”. Years ago I read of a couple who asked to be dropped on a “tropical island” with nothing but cameras to record their experience in living primitively. They were unable to even scale the jagged rock cliffs that lined the beach. They were picked up months later having survived primarily by eating raw shell fish. In a recent visit to Tanzania, I watched dozens of women making gravel by sitting next to a pile fo larger rocks and hitting them with a hammer. I could not imagine hours, days, weeks, and months of such dreary work. I am a mechanical engineer and immediately began dreaming of mechanical rock crushers that they might build. It felt like a genuine travesty that those women would spend their lives hammering rocks as their children hovered about amusing themselves with sticks, stones, and games. It also occurred to me that even the metal for the hammers required a number of interlocking technologies far beyond what most folks would imagine: mining, refining, machining, transporting, etc., etc. I am 58, and I am appalled to see the idea persist decade after decade that we would all be better off to live a “primitive” lifestyle. Thank you for debunking that idea so thoroughly. I like your piece and your preoccupation with those early steps. My interest is in the early (artistic) creation of that very early period – triggered when I discovered that I live between 3 sites of some of the very earliest findings of sculpture (Willendorf, Krems, Dolni Vestonice – Austria /Czech Rep). Coincidentally I started to collect casts of those – and got frustrated by the really very little good literature about this, and the amount of plain dumb publications. Recently I came across Douglas Bailey’s really cute and open minded reflections on this early art (“what is it when we look at a figurine? How do we look? What about its size? What about its shape? What does it make with us?” etc.) Unfortunately, Douglas is working only on the much later art, like 6-8.000 years ago, not the very old pieces of 25-30K yrs. But this is my point and interest: I like sharing and discussing those fresh new looks at the very origins oft pieces of human creation. Apologies for expanding so much on this, but it is just so welcome, and surprising to find you – of all people – coming through this unexpected gate. At a rainbow gathering no amplified music is allowed (unlike Burning Man), most food is cooked over fire pits, there is no central authority is recognized as legitimate. It is camping one step closer to fully primitive, and with many other people there it is an experience different than any camping trip. I predict that going without modern technologies will remain a hobby and recreation that will only gain in popularity, which is a good thing, because it helps us with perspective on our use of modern conveniences and also increases our ability to know what is truly useful and what is useless. Great post, Kevin. I’d love to know how much work time it represents. I was wondering where you’d found that statistic, and if you are familiar with the work of Mark Nathan Cohen. @Adam Holland: I’ve been reading Mark Nathan Cohen’s “Health and the Rise of Civilization.” I don’t recall his figures, but in general he doesn’t make as sweeping statements as I do! Excellent presentation. I indeed agree with your conclusion and very much enjoyed the intellectual discourse and historical account of the species. Thank you very much for your hard work here. 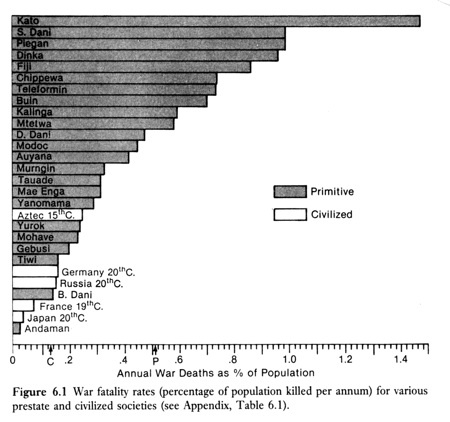 FWIW, there’s very little truth to your assertion about primitive warfare trumping “civilised” warfare. The Zulus, for example, succeeded in a couple of hubristic situations on the British side, but ultimately were defeated in other battles despite very large ratios (> 10:1) in their favour. “Here they come, thick as grass and black as thunder” – yet still defeated. And I say this as an Irishman, with no particular flag to bear in favour of the English. I am puzzled by the assertion that there were no old people in hunter gather societies. We humans are one of the rare species to have evolved the menopause in our females. The usefulness of this as an adaptation goes along the lines of â€œ my genes have a better chance of flourishing if I invest my energy into my genes present in my grand children rather than to start investing in genes in my own children which at my age I probably wont be able to support into reproductive adulthoodâ€. Somehow the menopause managed to get evolved into our species so somewhere in our history old women at least must have had a significant impact in our evolution. The investment of energy would be spent in foraging so the grand children were better fed and telling stories so passing on the culture of the family. Simply a wonderful post. That’s all I have to say. @ Gary Wolf: That’s for the book tip. I just ordered it. Really great piece! Much to think about. Interesting to contemplate the role of group size in our social evolution. The Dunbar Number concept suggests that there may be cognitive limits to the number of individuals with whom we can form meaningful social relationships and personal loyalties. The relationship of this to scaling the group decision process is of particular interest. For instance, how might the role of biological altruism impact social/political/economic decisions since altruism’s boundaries for any individual are tied to his/her boundaries of social identification. A current but glaring instance of problems in scaling altruism would be the Bernie Maddoff scandal… while one could scarcely consider his admitted crimes as an example of his altruism, it may be more accurate to say his actions were quite altruistic for those he identified as his “family” while considering his “investors” as a high-value food source (so to speak). So interesting for discussion is the evolving role of decision making as we moved from hunter-gatherers, to settled agriculture, to the rise of a middle-class and Adam Smith, to industrialization, post-industrialization, etc. I believe there are patterns that emerge. Wonderful article. The only thing you left out of the article was the fact that these societies without technology all possess a very small “carbon footprint”. Of course, as you point out, this highly coveted prize could be obtained by almost anyone within 48 hours if they choose to do it for themselves. Instead they prefer to force it on everyone else. I have a small question. You write: “all tools are extensions of our biological body.” That seems to be the underlying assumption of most attempts to classify technology that I’ve come across, but I have trouble with it. I would say that all tools are expressions of our will and that the great majority are, as well, extensions of our biological body. But it seems to me that there are some technologies that express our will without extending our biological body. An example: the genetically modified corn plant, one of the central technologies of recent human history. How does that extend the biological body? I would argue that it expresses the will by changing nature to better suit our needs but that it doesn’t represent an extension of the body. Am I missing something. Also, a quibble: Early in the essay you argue that our tools are natural. That’s true in a fussy sense but it hides more than it reveals. Our technologies may be natural to us, but in an important way they’re separate from “nature” – and that separation is critical to understanding their consequences. In fact, late in the essay you yourself draw a distinction between nature and technology: “Without technology, the rhythms and patterns of nature were immediate. Nature ruled your hunger and set your course … Turns out, the bounty of nature, though vast, does not hold all possibilities.” The idea of tools being natural, while certainly correct in a way, seems to me to be an unhelpful intellectual conceit. Finally, a more substantial (if provisional) criticism: You move slowly and methodically through the early history of technology, and you tell a compelling and concrete story. But toward the end, when you start to come toward “the point,” so to speak, you begin drawing in broader, quicker strokes – and I start, as a reader, to resist what you’re saying. For instance, you assert, in describing the life of early man, “your leisure was wasted.” You’re imposing on early man your own modern conception of what constitutes “wasted time,” which you seem to define as the absence of innovativeness. The very idea that leisure is something that shouldn’t be “wasted” is probably a byproduct of technologization, so it strikes me as a dubious criticism of the life of early man. The only reason this bugs me is that I sense a stacking of the deck. @Nick Carr: I appreciate your close reading and comments. They are very helpful. On the first one re tools as extension of biology. I should fix that because I was making a distinction at that point which I did not maintain consistently in the rest — which is between tools and technology. Tools being things you can make by hand yourself without systems or other tools. In this respect, tools become extensions of body. But I think that distinction is both too fussy and not useful (at least there), so I will correct my statement to hue more in line with what you say, since I agree. On whether technology is natural. I feel as if I wrote a whole book on this (Out of Control) argument and I guess I always want to short cut it without having to rehash the whole thing, but of course I need to do a better job since what I say is confusing. In many respects technology is fully as natural as life, and fully unnatural in our ordinary use of the word. This two-face paradox is a whole essay unto itself. We humans are animals — with no argument — but also not-animals — no argument — in terms of our identity. So I need to finesse how I say this. On your last point about the rush at the end. I plead guilty. It was getting long, and I wanted to wrap up. Also I have written about it earlier on the Technium, so felt I was repeating myself. You are right that because it is the pay off, I need to be as sharp as the warm up. So I will write another piece to nail it as I should have originally. regarding timing, i noticed an interesting series a few years ago: speech, ~50,000 ybp; writing, 5,000; printing, 500; telecommunications, 50. to this we could perhaps add the “writable web” (i.e. blogging), 5.
salient points: 1. this is an exponential progression, and 2. we’re sitting at the infinity point. If you’ve followed Julian Jaynes’ work (“The Origin of Consciousness in the Breakdown of the Bicameral Mind”), then you know that his rigorous interpretation of the earliest written human communications is that language and consciousness as we now know it emerged only ~3,000 years ago, despite 50,000 years of hominid tribes using tools and hunting and gathering and cultivating crops. You can listen to a recording of his own words about different ideas about the origin of consciousness at the Julian Jaynes website (http://www.julianjaynes.org/bicameralmind.php). IMHO, you just cannot ignore Jaynes’ four main theses, each of which can potentially stand or fall on their own (http://www.julianjaynes.org/myths-vs-facts.php): 1. consciousness based on language, 2. dating the emergence of consciousness, 3. a previous mental model based on auditory hallucinations called the bicameral mind, and 4. the neurological model for the bicameral mind. Following his thoughts–about a subtle yet fundamental shift in perspective being the origin of consciousness–tends to induce a subtle yet fundamental shift in your own perspective. This perspective simultaneously explains many otherwise inexplicable aspects of human sapiency, including the love of rituals, follow the leader instinct, oracles/divination, and the pervasive belief in spirit entities across all known cultures…all of which are seen as remnants of the old bicameral mind. The standard argument against this is generally based on “common sense” that hominids just couldn’t have developed complex technologies (projectiles, clothing, irrigation and agriculture, let alone language) without consciousness. Without a mind like ours we imagine no possibility of functioning like we do, and certainly no ability to “think of something new” as the prerequisite to creation. The logical counter-arguement is to simply show that most of our functioning in life occurs without any consciousness (and we’ve all had the experience of daydreaming/imaging while performing some routine function), and to remind that both ancient philosophy and modern science suggest that consciousness often just “goes along for the ride,” telling stories and claiming agency (a passenger in a train that thinks it is driving a car). How could anything new be created without conscious intent? Jaynes suggests that the bicameral voices dictated actions, just as schizophrenics today typically describe voices issuing commands (of all sorts). I heard a fascinating talk by Professor John D. Speth at the University of Michigan (“Protein, Fat, or Politics? Big-Game Hunting in Human Evolution”). See it at http://www.youtube.com/watch?v=FZ9UVswFzf4. He comes to some very different conclusions. For example, if you look at the patterns of hunting versus gathering in modern tribes, you note that gatherer-type foods (nuts, bugs, fruits, etc) have high availability at some times of the year, and are virtually unavailable at other times. You might expect that hunters would go out when other food sources are unavailable. In fact, hunters go out hunting for meat at exactly the same time as gatherer-type foods are most available! There’s a good reason. In many parts of the world, wild animal meat has extremely low fat content – 1 or 2%. 19th century accounts by European explorers with modern firearms on hunting expeditions in Africa tell the same story – starvation by abundance! They feasted every night, and lost weight. Human beings can’t live on lean meat; the Atkins diet works for a reason. This guy turns the common wisdom on its head – if it weren’t for sources of carbohydrate and fat, human beings couldn’t hunt at all. Hunting is primarily a male social activity, just like it is today in states like Michigan, where 700,000 armed guys (mostly) head out for unneeded protein every fall. Hi Kevin: This was excellent. I have one question. Was this in any way sparked by the Series Finale of Battlestar Galactica which aired on March 20th? The reason I ask is because of the ending – it was a deus ex machina in which technology is rejected. There has been a huge debate going on on chat boards about this ending and much of it revolves around subjects who raise in this post. @David Levin: Nope. I have not yet seen any episodes of the last season of Battlestar. I am waiting for it to reach DVD since we don’t have TV. No spoilers please! He does wax eloquent but so do Biblical scholars weaving their own myths. It’s hardly cerebally taxing to repeat established scientific dogma, much similar to repeating a prayer, I suppose. Have all the intellectual beacons been extinguished? Technology has always been around. What do you think created that smoke?